A simple and affordable DIY kids craft is paper tube ornaments! This kid friendly ornaments project does need parent supervision as scissors and glue are needed. You can get really creative with these kid friendly ornaments! Let your little ones paint the tubes whatever colors they would like. Then, parents, cut the tubes horizontally at about ¾” to 1” strips. You’ll then pinch the sides of the tubes to make a leaf-like shape out of the cut tube. 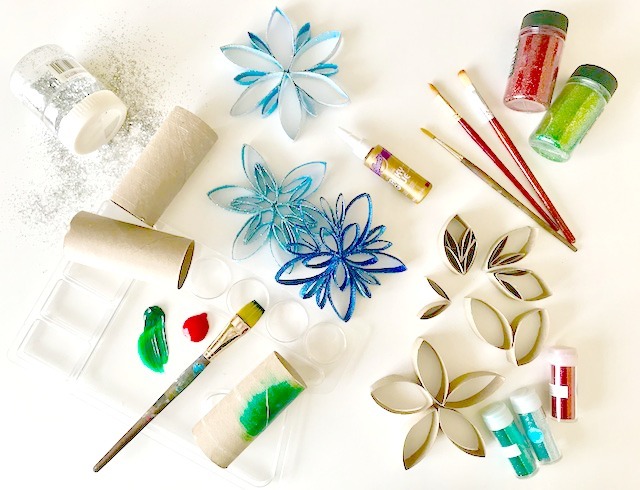 Assemble the different shapes into a snowflake, poinsettia, or any fun design your kiddo likes! And, finally, glue the pieces into place. Crafting Tip: If using a wet glue like Tacky Glue, paper clips can help keep the shape while your glue dries.</p? If you would like to jazz up your ornament with glitter, spray it with adhesive then shake your glitter all over your ornament. You can also take your leaf shapes and fold them in half. By placing a folded piece inside of a leaf shape you can add more dimension to the ornament! Have any questions? Please comment below! If you tried this out, I’d love to know!